Lincoln Recent News: Lincoln School Rules the Pool at Little Angels! The weekend of September 10-11 was a spectacular one for the Lincoln (Swimming) Snow Leopards, filled with personal bests, a bucket of medals and record breaking times. We ended the competition with over 220 points and placed first among over 50 schools. After day one, our swimmers had already earned the team 110 points, with the 2nd place school on 28 points. More importantly, our swimmers had a positive attitude throughout the entire competition, supporting and respecting their teammates and competitors and learning from their experiences. On both days, the majority of our swimmers made it to the finals, while their times represented their hard work and dedication. Throughout each day, we had LS representation in virtually every final, with some events totally dominated by our Snow Leopard swimmers. Although our female swimmers usually dominate the Nepal swimming scene, this year's squad is much more gender balanced with some great male swimmers coming through. This bodes well for our upcoming SAISA meet. 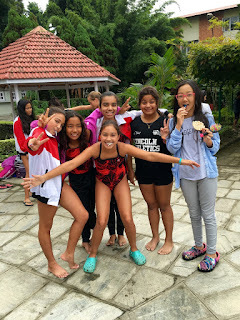 As for the standout stats, our sprint sensation, Niharika Tuladhar, broke 3 different Lincoln records for the 50 back, 50 fly, and 50 breast, earning herself the best female swimmer of the meet award, which is based on FINA points. Shreetika Singh and Oshina Bharati also had outstanding meets and broke the record for the 200 Individual Medley with Shreetika just pipping Oshina to gold. Our boys relays showed their strength in depth by breaking both the 4*50 Medley Relay, as well as the 4*50 Free Relay records. In addition, Alex Shah broke the 13-14 boys' records for the 50 back and 50 free, while Tisa Shakya broke the 13-14 girls 200 IM, 50 fly and 50 free records. Also in that age group, Ayushma Tuladhar broke the 50 back record. In the 11-12 boys, Nasir Hussain broke the school record for the 100 IM and 50 back as a 10 year-old! We also won gold in all six of the relays. We look forward to the upcoming meet at Lincoln on October 1 & 2 so that our Leopards can once again show their hard work, dedication and love for the sport.